The acclaimed debut thriller from Australia's most exciting new crimewriting talent. The 2nd Caleb Zelic title, AND FIRE CAME DOWN, will be published October, 2018, and the author is already writing a 3rd installment. Caleb Zelic can't hear you but he sees everything. Caleb Zelic's childhood friend has been brutally murdered - fingers broken, throat slit - at his home in Melbourne. Tortured by guilt, Caleb vows to track down the killer. But he's profoundly deaf; missed words and misread lips can lead to confusion, and trouble. Fortunately, Caleb knows how to read people; a sideways glance, an unconvincing smile, speak volumes. When his friend Frankie, a former cop, offers to help, they soon discover the killer is on their tail. 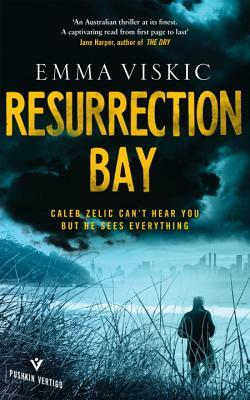 Sensing that his ex-wife may also be in danger, Caleb insists they return to their hometown of Resurrection Bay. But here he learns that everyone - including his murdered friend - is hiding something. And the deeper he digs, the darker the secrets...?